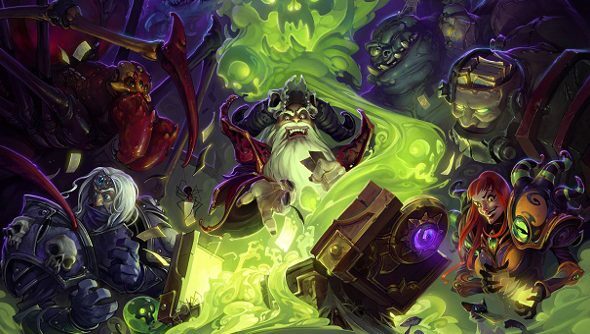 If you’ve quite had enough of having your rear-end handed to you in Hearthstone’s competitive matches (or, indeed, handing other people’s rears to them), then you can soon enjoy a little solo time with those fancy cards of yours: Curse of Naxxramas, the single-player adventure for Hearthstone, will be landing on Tuesday, July 22nd. An event series will kick off from Tuesday, with a new ‘wing’ of Naxxramas opening up each week. The first wing – the Arachnid Quarter – will be free to anyone who plays during the launch event, and remain permanently unlocked. Subsequent wings can be unlocked through microtransactions with real money, or by using the gold you have amounted in-game. Along with The Walking Dead’s penultimate episode, this makes two must-play titles releasing next Tuesday. Of course, Curse of Naxxramas will reward you for playing with a fabulous collection of new cards to add to your deck, whilst The Walking Dead provides only nightmares and tears.